In 1824, 30 years after the establishment of the Russian Orthodox mission on Kodiak Island, a new phase of mission work among the Alaskan people commenced. At that time Fr. John Veniaminov, a 27-year old priest, arrived on the Aleutian Island of Unalaska, Alaska, with his wife and family, thus beginning the 37 years of missionary work in Alaska of St. Innocent, Apostle to America. On Unalaska the young Fr. John built the Holy Ascension Church (photo to the right). Fr. John was born in 1797 in the small village of Anga, near Irkutsk, Siberia, seven years before the glorification of St. Innocent of Irkutsk. After his father reposed, the future saint lived with his uncle, the parish deacon, in the family house in Anga (photo to the left). Then, for eleven years he attended the school that St. Innocent had established in Irkutsk. Thus, it was very appropriate when Fr. 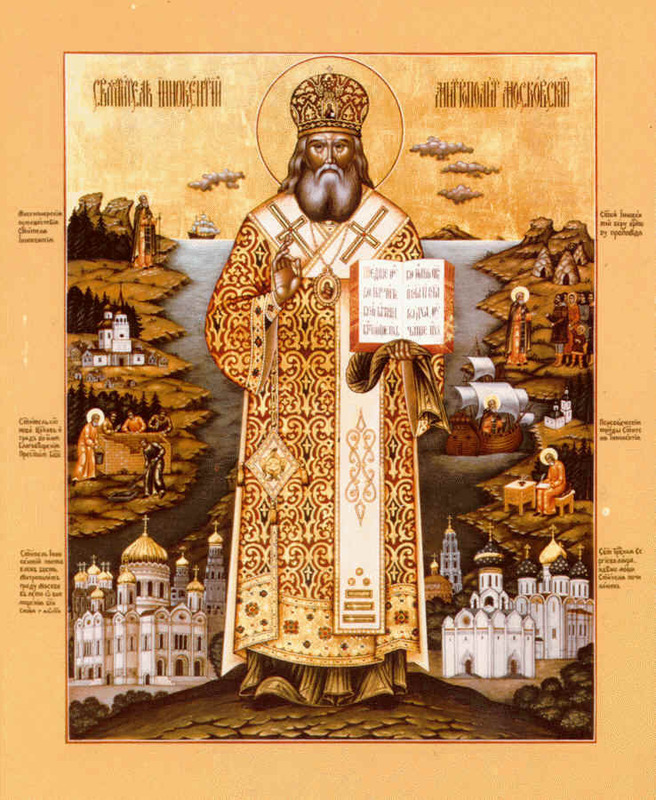 John later received his monastic name in honor of St. Innocent of Irkutsk, the "Holy Man of Siberia." The brilliant future saint and bishop had numerous gifts in addition to his zeal and love of God. Besides being a scholar, linguist, scientist and writer, he also had many practical and technical skills. In Alaska he worked tirelessly on behalf of the people. He learned the Aleut and other native languages and created written alphabets for them, so he could translate the catechism, liturgical books and Bible for the natives and teach them to read. 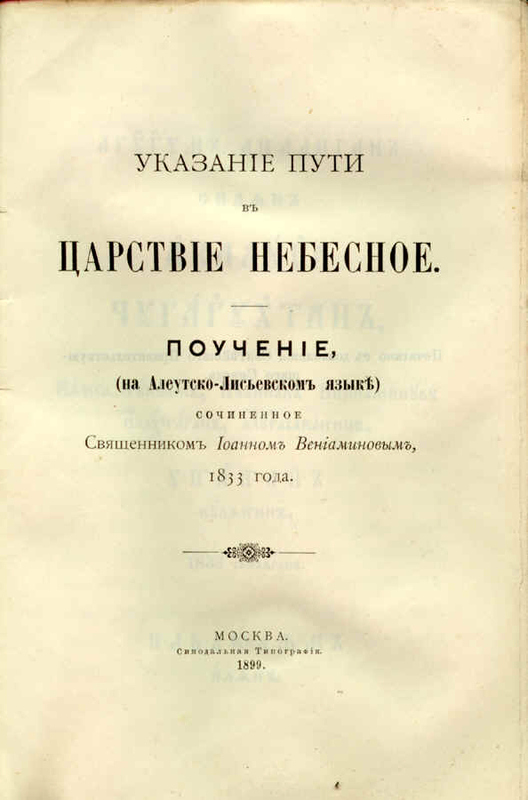 His famous book, The Indication of the Path to the Kingdom of Heaven has gone through countless editions in many languages (the photo to the right shows an 1899 edition), and is an Orthodox spiritual classic. An original copy of his translation of the Gospel of St. Matthew into the Aleut language (photo to the left), that includes some of his own hand-written notes, is still in the Ascension Cathedral in Unalaska. Throughout his 43-years of missionary work in Alaska and Siberia, the saint traveled extensively, teaching and preaching to the people, who loved him for his gentleness and compassion. As Fr. Herman also had done, Fr. John taught the natives practical skills: construction, carpentry, gardening, animal husbandry, metalworking. He built churches, orphanages and schools, where trades were taught along with religion and traditional studies. In 1852 Bishop Innocent’s diocese was enlarged to an archdiocese, to include the northeastern areas of Siberia. When he moved the center of his activity to Yakutsk in Siberia, he appointed an auxiliary bishop for Alaska. In spite of his requests to retire due to ill health, in 1869 (just two years after Russia sold Alaska to the United States), St. Innocent was made Metropolitan of Moscow (the Head of the entire Russian Orthodox Church), from where he continued to watch over his former mission fields. When St. Innocent reposed in 1879, he was buried at the Trinity-St. Sergius Lavra Monastery in Sergiev Posad, about 45 miles north of Moscow. 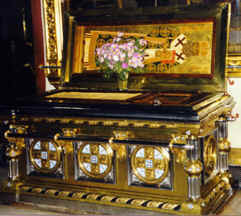 He was glorified as a saint in 1977, and now his relics are in a very prominent place, in front of the left front pillar in the Dormition Cathedral at the Lavra (photo to the right). As a result of the missionary work of St. Herman and St. Innocent, many thousands of native Alaskans came to know the Lord, and Orthodoxy was established in America, of which all Orthodox people in America are heirs today. 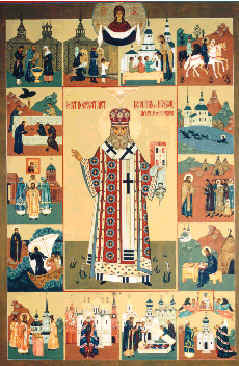 In the photo to the left we see a contemporary Russian icon, which includes scenes from the saint's life. In the photo to the right is a small detail showing St. Innocent of Alaska, which is a part of a full-wall-size icon of the first five of the American saints, painted/written in 1971 by Fr. 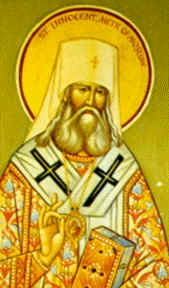 Theodore Jurewicz of Erie, Pennsylvania, and located in St. Innocent of Irkutsk Orthodox Church in Redford, Michigan. Bringing many people to the knowledge of Truth. All the photos are by the author, except for the icon at the top, with scenes from the saint's life, which is © by the OCA, and is located in the OCA Chancery in Syosset, Long Island, New York.